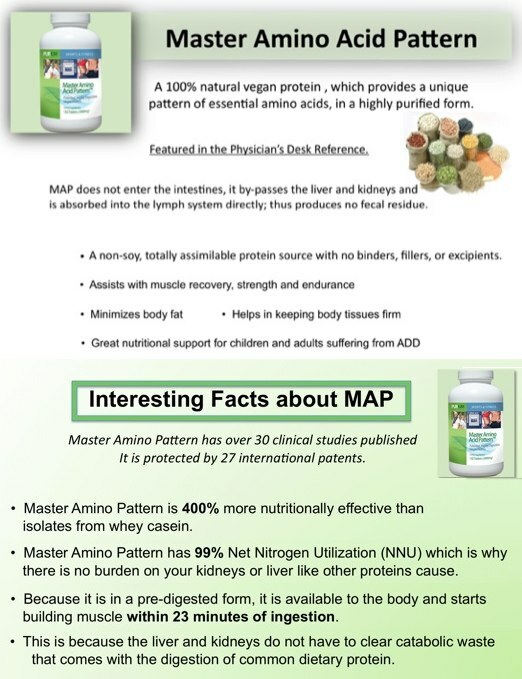 Introducing the purest, most effective, plant based Amino Acid / Protein source on the planet, The Master Amino Acid Pattern! Who will benefit from the use of MAP? Dietary Proteins and Protein Supplements. elimination and other stresses on the body. Lucà-Moretti, M., Grandi A., Lucà E., Muratori G., Nofroni M.G., Mucci M.P., Gambetta P., Stimolo R., Drago P., Giudice G., Tamburlin N., Karbalay M., Valente C., Moras G. Master Amino Acids Pattern® as sole and total substitute for dietary proteins during a weight loss diet to achieve the body’s Nitrogen Balance equilibrium. Advances in Therapy; 5:270-281, 2003. Lucà-Moretti, M., Grandi A., Lucà E., Mariani E., Vender G., Arrigotti E., Ferrario M., Rovelli E Results of taking Master Amino Acids Pattern® as a sole and total substitute of dietary proteins in an athlete during a desert crossing. Advances in Therapy; 4:203-210, 2003. Lucà-Moretti, M., Grandi A., Lucà E., Mariani E., Vender G., Arrigotti E., Ferrario M., Rovelli E. Comparative Results Between Two Groups of Track and Field Athletes with or without the use of Master Amino Acids Pattern® as protein substitute. Advances in Therapy; 4:195-202, 2003. Confirms the Discovery of the Master Amino Acid Pattern. Annals of the Royal National Academy of Medicine of Spain, Madrid; Vol. CXV: 397-416, 1998.
we are now able to target exactly what the body needs. 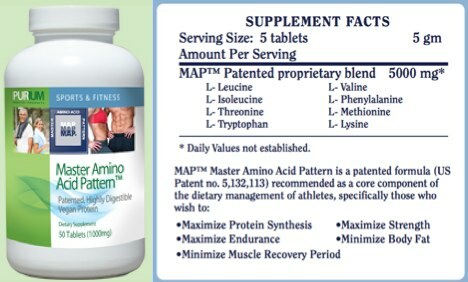 Master Amino Acid Pattern is an integral part of our 10 Day Transformation Cleanse! When doing the 10 day cleanse the Master Amino Acid Pattern keeps the body in an anabolic state as opposed to a catabolic which is the norm with most cleanse and weight loss protocols… this is what makes our cleanse different from others in the market and more than anything makes it VERY SUCCESSFUL! Want to save $50 on a 10-Day Celebrity Transformation that comes with the Master Amino Acid Pattern?